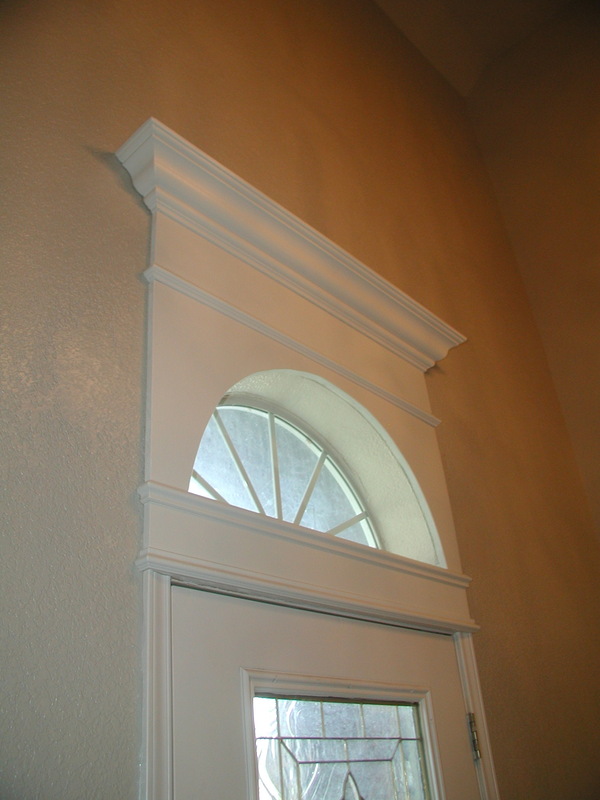 I posted about some overhead door moulding cornices that we saw on the Parade of Homes and that we already did a large moulding Cornice on the inside, over the front door. I’ve had a lot of hits on those pages and since there is so much interest, here is a DIY Tutorial on how we did it. First, we sketched out what we were going to do, along with planning measurements for the moulding’s height and width and calculations for lumber. 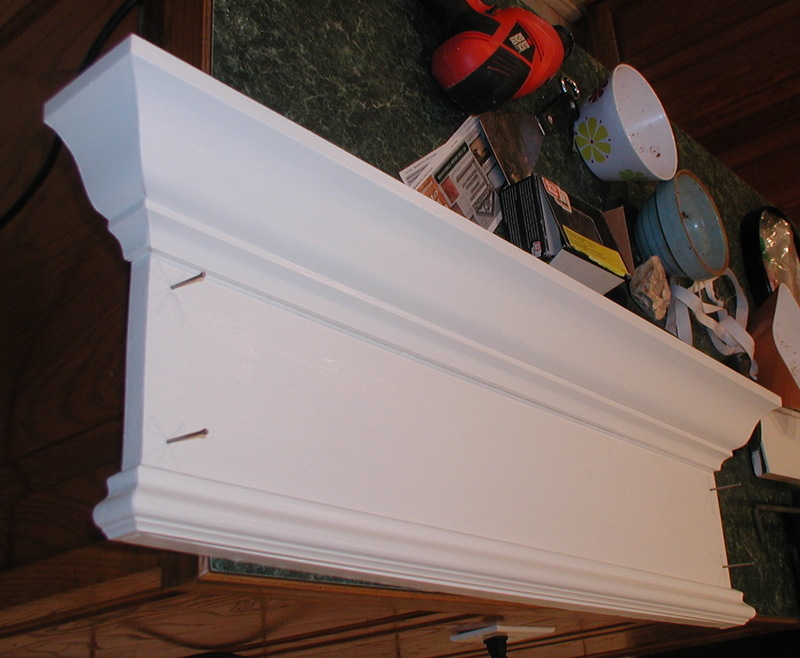 For two door cornices (one above the pantry door in the kitchen, and the other, the under-stair closet in the front entry hall) we needed 6′ of trim moulding and 8′ of Crown, and all the lumber came out to be about $36. 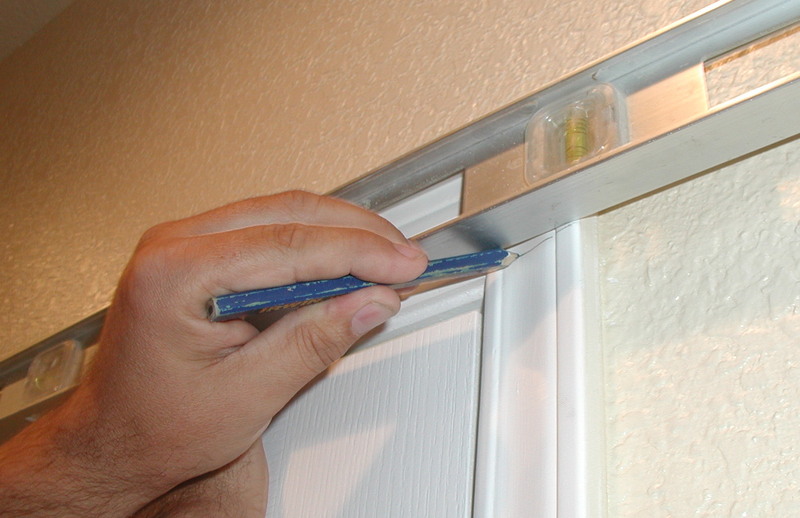 Use a mat knife to cut the paint/caulking seal around the top piece of door moulding. This makes it easier to remove. 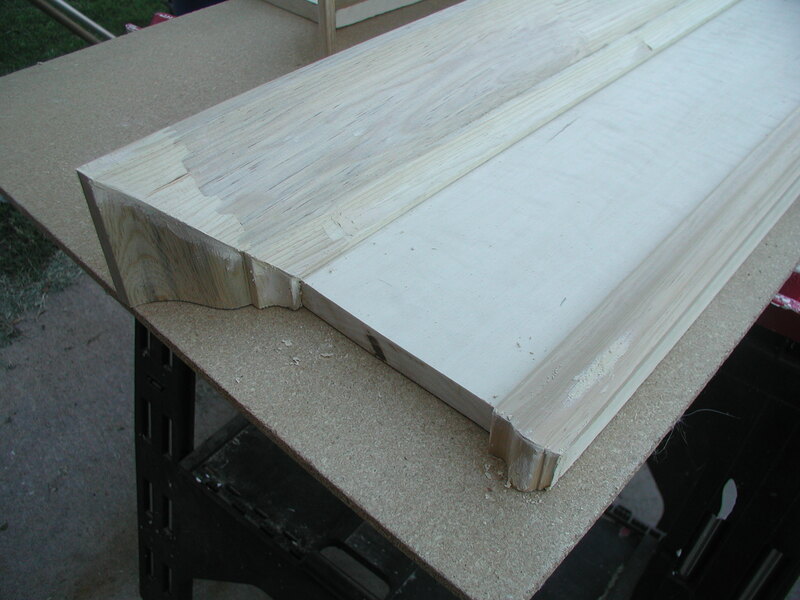 Level the top of the vertical moulding pieces with a small hand saw such as a Coping Saw. Once all the top trim is removed, pull out any leftover nails and measure the width (left to right form the outside of each vertical moulding) for a total width. 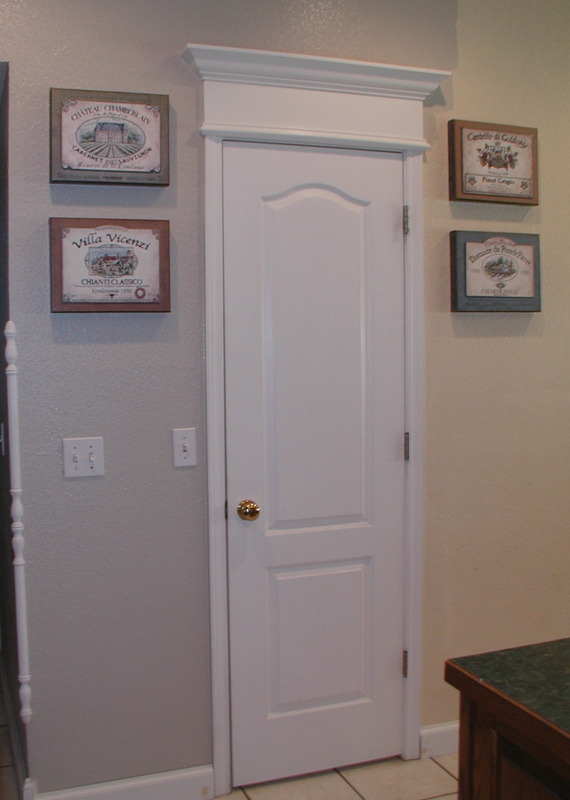 To do this project you need three types of wood – crown moulding, base or trim moulding, and a board that fits the size of your project’s height. Cut a horizontal board the width you measured earlier. Sand or rasp smooth the ends and any rough edges. Cut the small, bottom trim. This is a 45 degree cut using a radial arm saw. 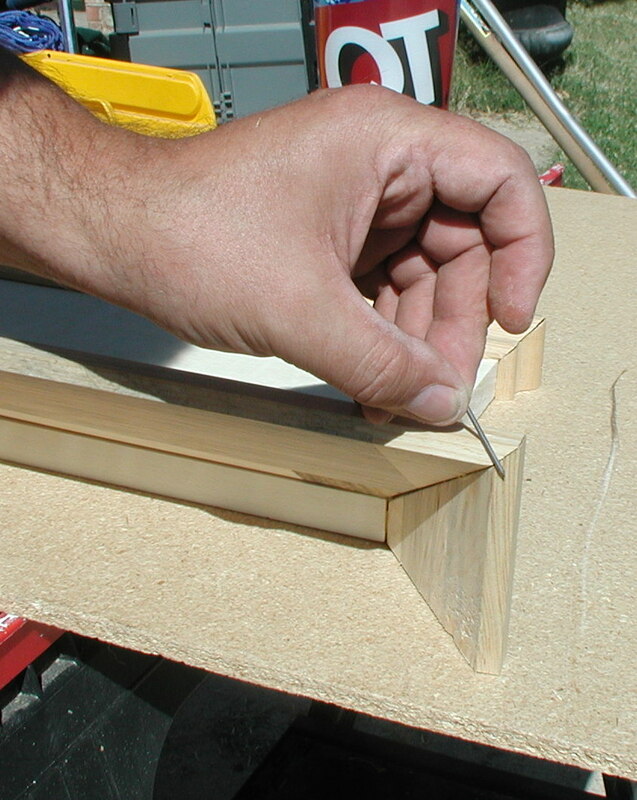 You can also use a miter box but it is a bit more time consuming and you need a steady hand. Do the front piece first, then the two, smaller side pieces. 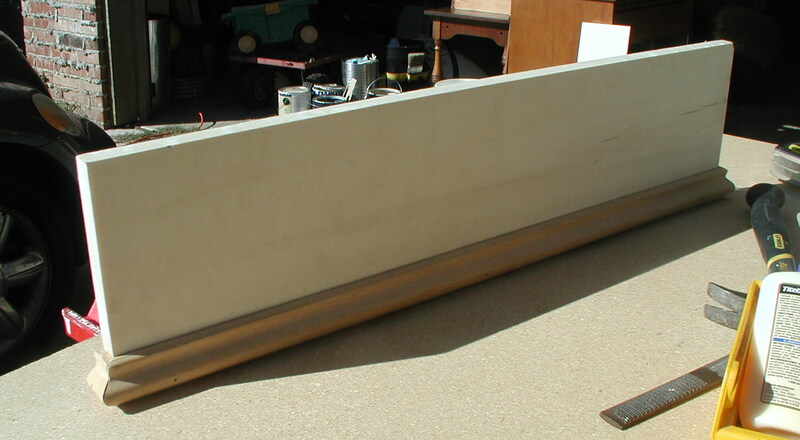 These pieces are assembled at what will become the bottom of your horizontal board. 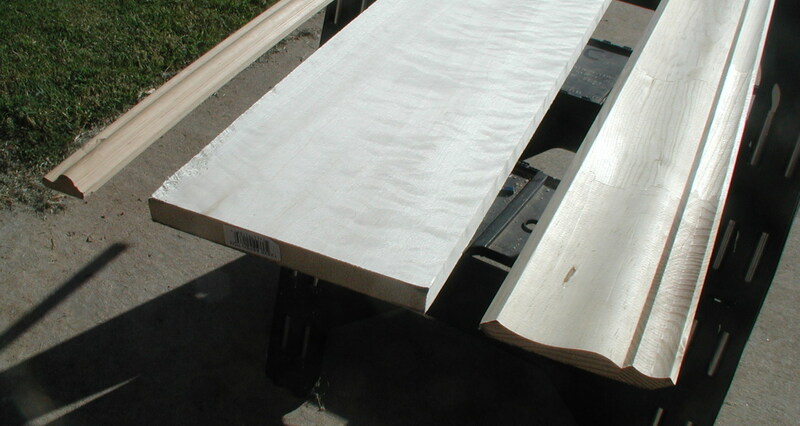 Wood glue is applied to the end pieces, and they are nailed in using a finishing nail. 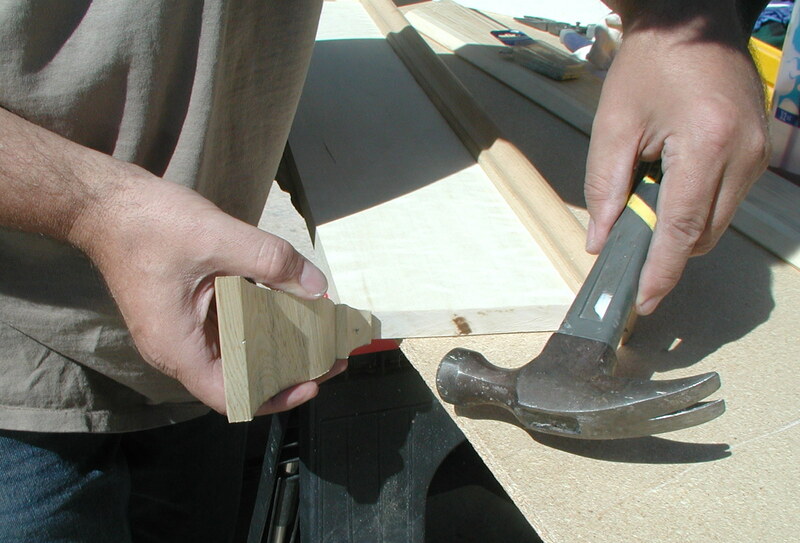 Tip: if not using a finishing nail gun with a compressor, pre-drill a smaller diameter hole (i.e. pilot hole) for your nail to use as a guide. The middle section also gets some wood glue and is nailed into place with finishing nails (through pilot holes) onto the large horizontal board. Repeat with the Crown Moulding. 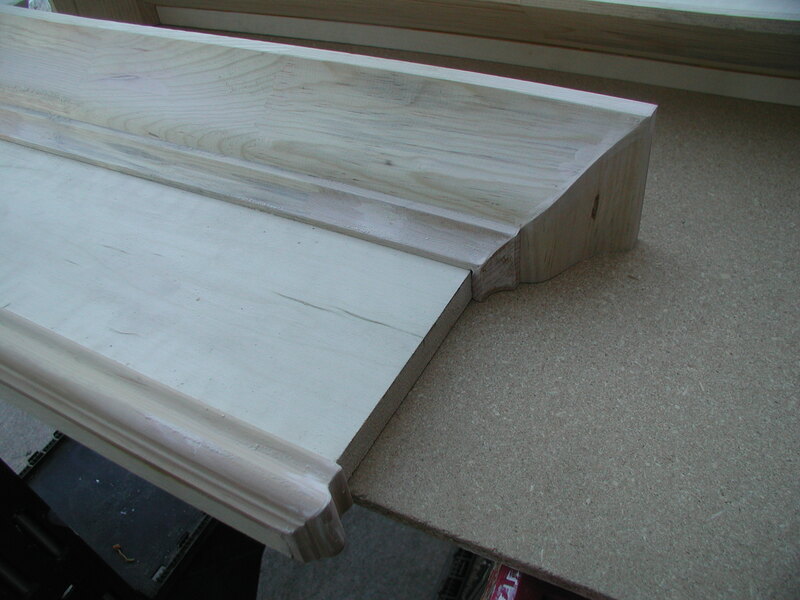 Crown Moulding is also cut at a 45 degree angle but takes some special handling which I will cover in a later post. 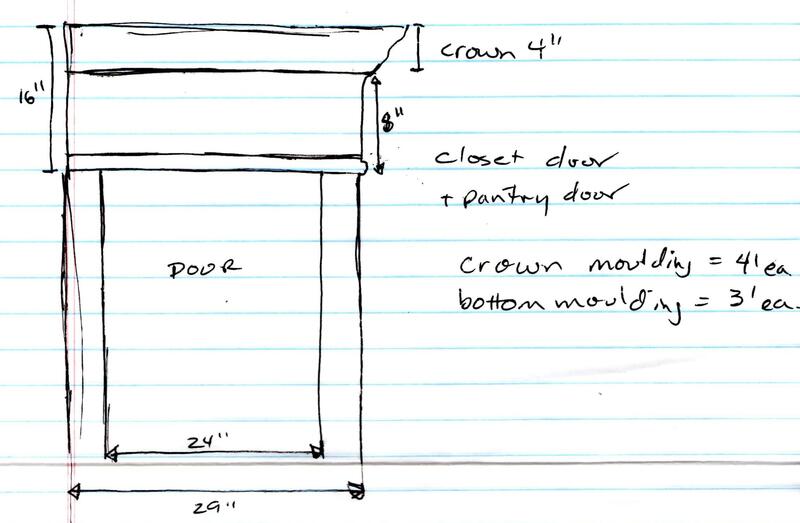 If this is your first time working with Crown Moulding be sure to research some videos to show you how – it’s not impossible but does take some careful planning and know how. Again, glue, attach and nail the Crown at the ends first. 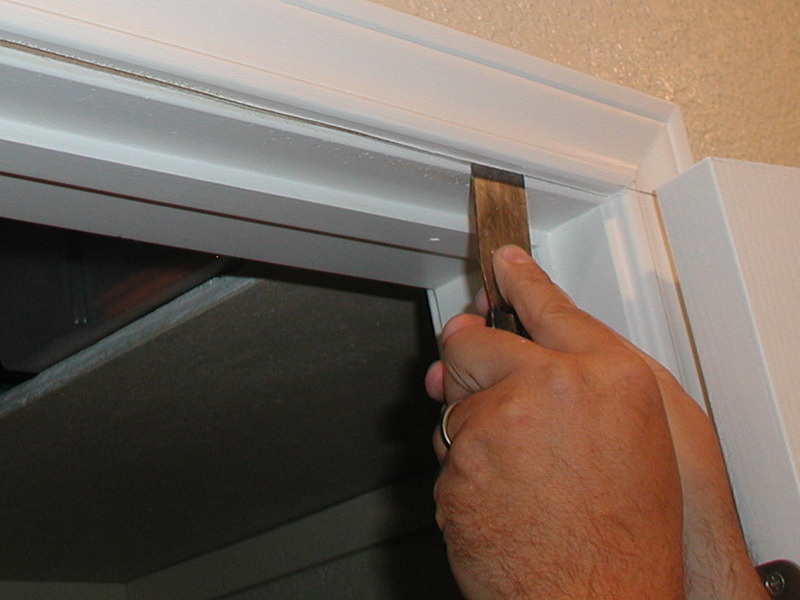 Ends are attached using smaller finishing nails (or brads) as the Crown moulding is too thin for the larger finishing nails. The corners need to be attached to each other for support (nail shows diagonal nail path, but we used a smaller nail then shown). It takes a little extra time, but drilling a pilot hole let’s nails easily go in. Finishing nails are recessed using a nail-setter. After the Crown moulding was nailed into place, the corners were taped with painters tape and it was left to dry for a few hours. 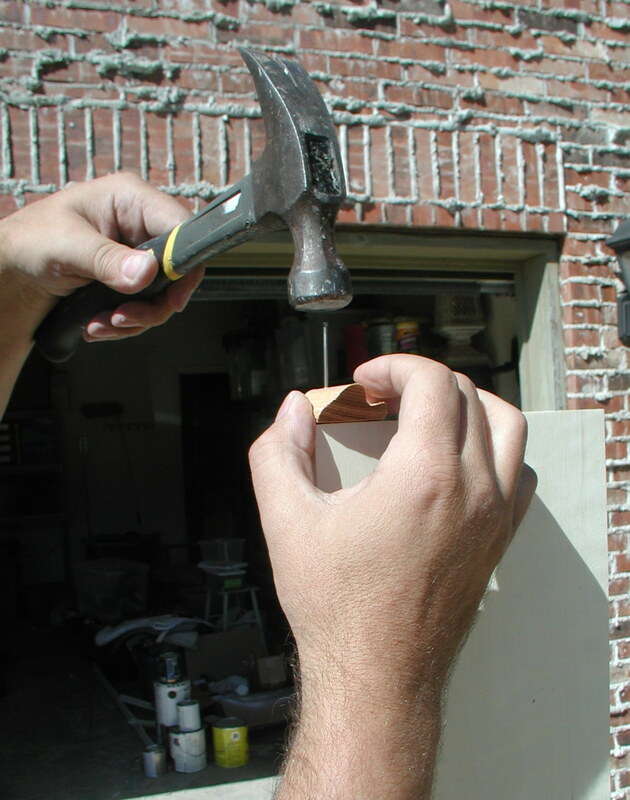 After glue is set, use wood putty applied with your finger into the recessed nail holes and the joining corners of moulding. …and after it dries, it’s sanded smooth. It’s painted first with a brush to get into all the lines of the moulding. Because this is bare wood, the paint is soaked up quickly; if you prefer you could use primer at this stage. 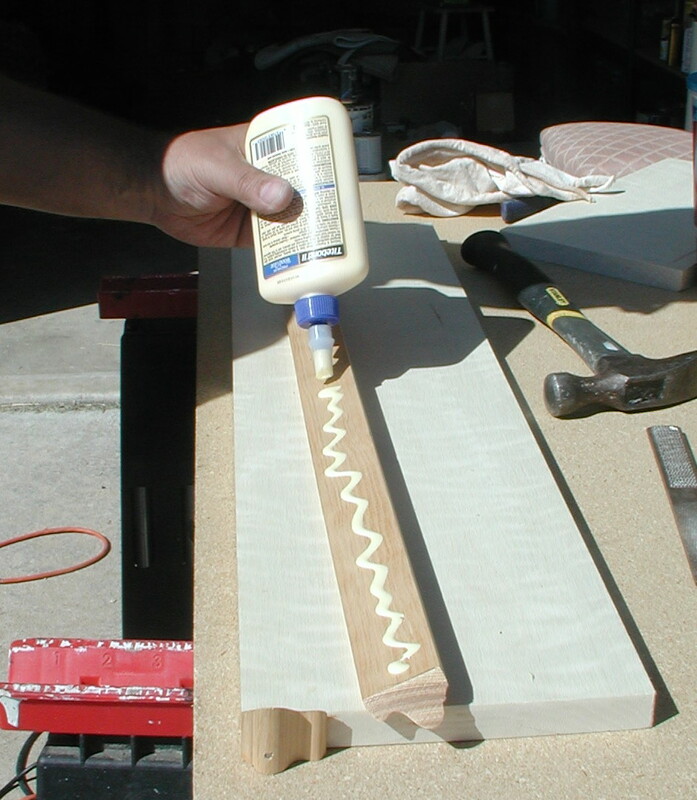 Two additional coats are applied with a 4″ cabinet foam roller; generally, I give a light sanding between coats for a very smooth finish. Tip: it’s much easier to paint before it goes up! Now you are ready to get your Cornice up on the door. First, drill pilot holes and push in your finishing nails so they are aligned correctly. There generally is a stud running the same direction as the side moulding so be sure to attach along the side for extra, holding strength. Construction Adhesive on the back is helpful. Set on top of the door and make sure it is centered. Finish hammering in the nails, recess the nail heads, fill with wood putty, let dry, sand smooth and give it all one last paint coat. 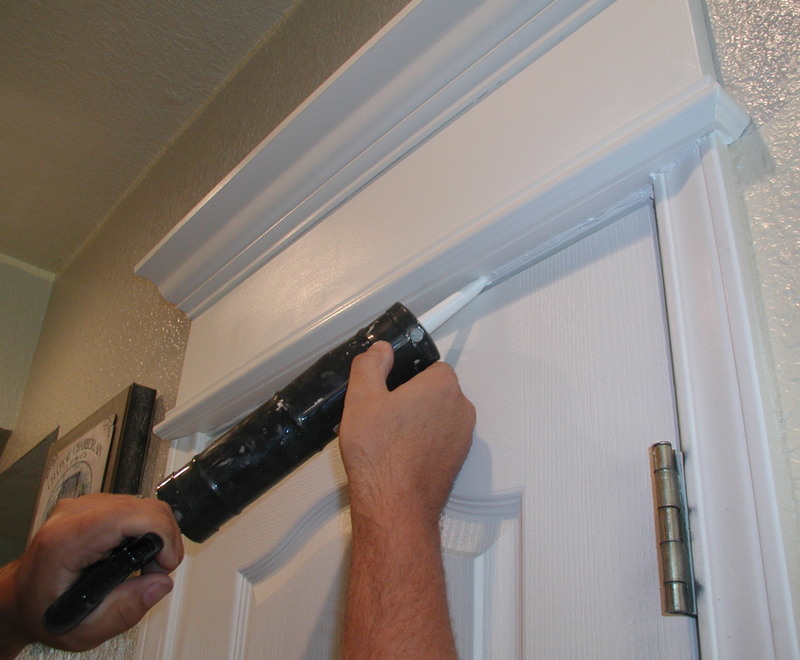 A line of interior caulking on the inside bottom of the door gives a clean look. View from kitchen to the entry hall, showing closet door on left, and front door on right. 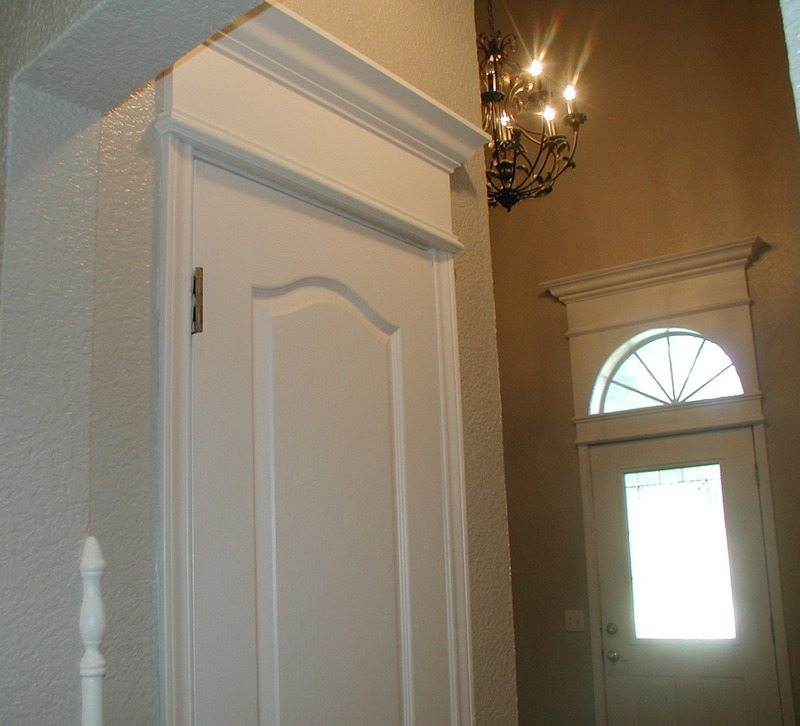 Entry door with a larger, overhead Cornice moulding (the moulding in the middle covers a seam) which was about $125 due to the height of the board used and the size of the crown moulding used..
LOVE IT! And only $18 each for the smaller Cornices! Well worth the money investment especially if you have higher ceilings; the cornices draw your eye right up, enhancing the height of the room. BTW if you want something simpler, Lowes is now selling a kit (called Archetype Over Door and Window Moulding) found in the moulding section of the store. It’s not as fancy but would be easier for those who don’t want to do all the work shown above. That’s a pretty useful blog! Thanks for the tips and guidelines. It sure helps. The door is very neat and elegant! Who did the brick on your house? Looks like they used a little too much mortar. It’s called Weeping Mortar and is an on-purpose effect. What is the painters tape for the corners ? The painters tape is only there temporarily. 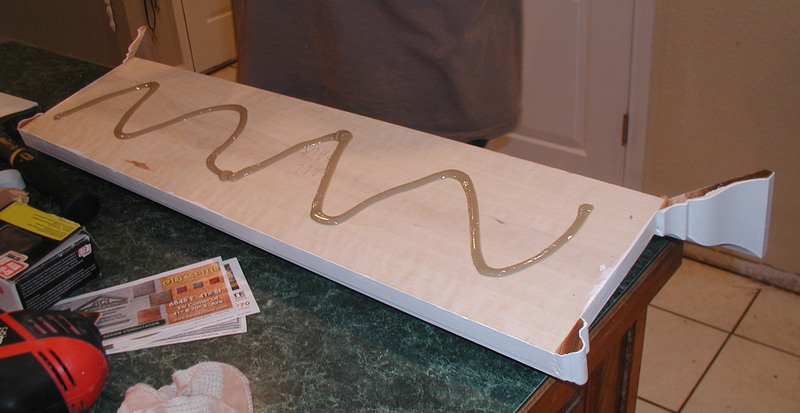 Since some of it is glued, you can use the painters tape to hold it in place until completely dried. I didn’t grab a photo of it but mentioned it for those who would want to use it.